1) A bug causing pages to print with the URL of all links displayed has been fixed. 2) Troops now have the option of setting their publicly viewable calendar to be an agenda view rather than a month view (go to Manage -> Settings -> Edit Settings and click on the TroopTrack Settings tab). 3) The public calendar now includes a left menu so that visitors can navigate back to your web pages. 4) The award books now include links to the requirements of each award displayed. 5) The pages for displaying the generic rank and merit badge requirements were not working as a result of the subdomain changes we made. You probably didn't notice this because the pages for displaying the requirements for a specific youth were working fine. This is now fixed. 6) Some of you complained that the Google Translate widget was confusing people on pages where there was little content because it would show up near the top of the page. We have changed the page layout so that it is at the bottom no matter what. 7) The advancement overview now sorts achievements and groups them by completed, started, and unstarted. 8) Troops that do not renew their TroopTrack subscriptions will lose their subdomains after 60 days. This does not apply to Trail Life USA troops. That's it! All of these changes will by live by approximately 8:30 AM Central Time. MAJOR CHANGE: Subdomains are now mandatory whenever you are using TroopTrack. That sounds kind of ominous, but it is going to be very helpful in lots of ways. We introduced support for subdomains in TroopTack several years ago and it has been very popular. In case you don't know, a subdomain allows you to have a url that is specific to your unit, such as troop-31-weatherford.trooptrack.com. - Subdomains don't actually determine which troop you are accessing. You can go to troop-demo.trooptrack.com for example, and if you are logged in it will still show you data for your troop. We think this is confusing. - If you click a link in an email, such as to RSVP for an event it will sometimes result in a "Not Found" error. This happens if you are using our multi-troop feature and you are currently looking at a unit that is not the unit the link is for. Fixing these problems has been high on our list because they were preventing us from adding other features we are excited about, like allowing users to RSVP to events without logging in. All interaction with your unit will happen via the subdomain. If you go to trooptrack.com and log in, it will redirect you to the subdomain of your unit if you belong to only one unit. If you belong to more than one unit, it will ask you to choose a unit and then will redirect you to the subdomain of the unit you choose. We also updated all emails with links in them to include the subdomain in the links. We also released a ton of minor fixes, but I'm going to post them separately because this post is already a novella. We announced a major change in the previous post this morning. This post will detail all the minor changes that went with it. 1) People who visit your web site (via the subdomain) but are not logged in or are not a member of your unit will no longer see the "Plan", "Manage", "Communicate", "Achieve", and "Share" menu or any other actions that are reserved for members of your unit. 2) On the event details page, it listed a count of everyone who has RSVP'd by member type (youth, adult, guest, etc) and then added them all together and called it "Total Guests". Many of you found this confusing so we have changed it to just "Total". 3) There was an irritating scrollbar on the view for adding new transactions to money accounts. We've removed it. 4) We have updated our mailing address. We are now at 220 Fort Worth Highway #600, Weatherford TX 76086. 5) For troops using the "LDS Scouting" setting the patrols page was supposed to display an image for each patrol, but instead it was showing the URL of the image. This is fixed. 6) For certain settings of events, we were not showing who was invited on the event details page. We now show who is invited for all events regardless of settings. 7) The patrols page uses a concept called "caching" very heavily in order to make it perform well. We fixed a minor bug in the caching. 8) We have added support for generic unit types so that anyone can use TroopTrack to manage their youth group, even if we don't offer support directly. Phew. Have a great day! We are always working on the small bugs and feature requests you send us, but we also spend some time working on the big picture stuff. Ever wonder what that includes? Here's a quick rundown of some of the things in various stages of development at TroopTrack. 1) Public events. Sell tickets to your pancake breakfast or regional camp to the general public online. 2) Support for subdomains in emails. When this goes live, you will be able to send emails to everyone@pack31.trooptrack.mail, etc. This is a big change that will enable lots of cool features we can't do without it. 3) A comprehensive user guide that is integrated with the platform. How would you like a link that shows you a list of all user guide pages related to the page you are on? We think that would help a lot. I hope you find this list exciting. Have a great day! This morning we released an important change to the way web pages are accessed. In the past, web pages have included the word "comatose" in them. This was because TroopTrack web pages were originally based on a product called Comatose. It's a stupid name for a product, and maybe that's why it was eventually abandoned by its creators! When they abandoned Comatose, we re-wrote web pages ourselves, but the word "comatose" remained in our web page URLs. Many of you have complained about this because it's confusing. After all, who wants to read a "comatose page"? But wait! What if people have bookmarked one of our pages? Won't this break those bookmarks? We've had a ton of tickets asking for this change, so we hope you're pleased with this change. REMINDER: Our office (and our helpdesk) will be CLOSED tomorrow at 3:00 CT and all day Saturday while we move to our new office location. It feels like it's been a long time since we had a release. Five days between releases is a bit too long for my taste. This morning we are pushing a change that is very important to AHG Troops, along with a few other features. 1) AHG troops can now designate a unit as a "Pi/Pa" unit. You can then put your Pioneers AND Patriots in this unit. There is no need to set a level for this unit - just go to Manage -> Units and click "New Unit" to create it. On the form there is a new field for designating the unit as a Pi/Pa unit. Just check that. You are now also able to manage a girl's level directly from her profile. There is a new level field below the unit field. We also added a feature to allow you to promote all the Pioneers to Patriots at once. You will find this link on the Pi/Pa unit under Manage -> Units. 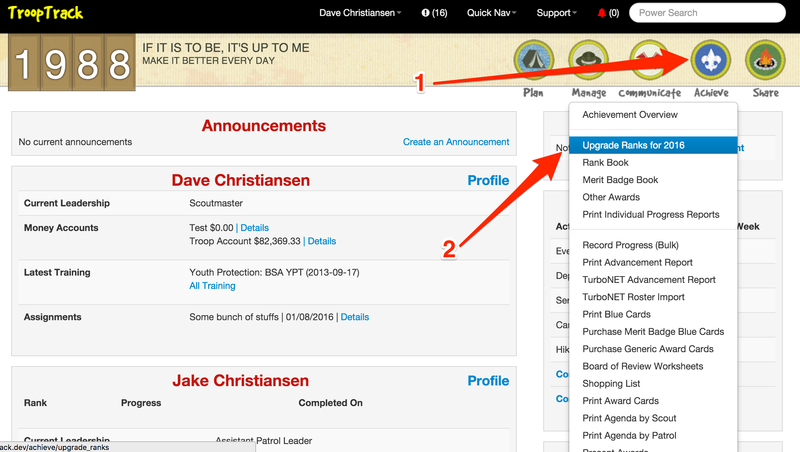 2) Sometimes customers sign up with long troop numbers and this was making the header menu look bad. We've adjusted the header menu so that if you have a long troop number we deal with it more gracefully. 3) We added the ability for users to edit any comments they leave when they RSVP for an event. 4) We've added the ability for leaders to hide any comments made when members RSVP for an event. 5) We have also fixed a bug preventing the "Promote" feature from working in the "Unassigned" patrol/den/unit. 3) Scouts imported via TurboNET will import to the 2015 ranks rather than the 2016 ranks. You will need to upgrade ranks after importing. 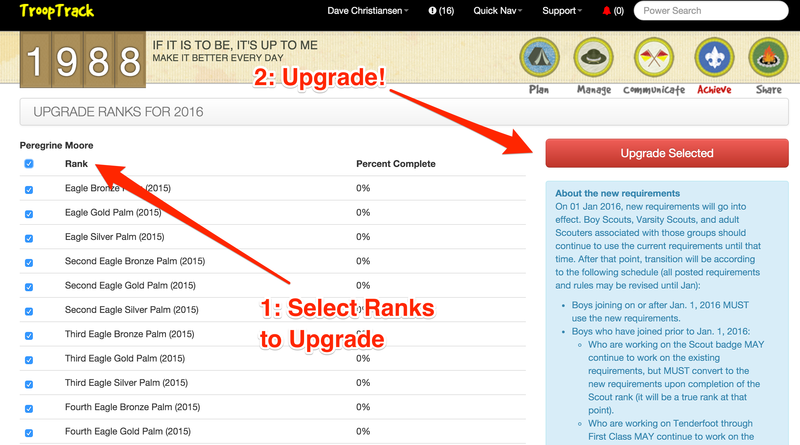 4) Member of Ships will still be able to work on BSA ranks and merit badges if they want to - just click the "Still Scouting" button on the user profile. 5) The "quick switcher" on user profiles was intended to let you stay on the achievement tab of profiles, but change to other members, but it wasn't. This is fixed. 6) The AHG Connect importer was assigning the wrong level to girls. This has been fixed. 7) The AHG Connect importer was including inactive users. This has been fixed. Not bug fixes, but we also launched support for Exploring Posts as a BETA program and we officially ended the Sea Scouts BETA program. It is now a live program. Fixing these problems is high on our list because they are preventing us from adding other features we are excited about, like allowing users to RSVP to events without logging in. All interaction with your unit after February 1st will happen via the subdomain. If you go to trooptrack.com and log in, it will redirect you to the subdomain of your unit if you belong to only one unit. If you belong to more than one unit, it will ask you to choose a unit and then will redirect you to the subdomain of the unit you choose. We think you will like this change and so will we. It will simplify a lot of code on our side that was a bit problematic and it will make it a lot easier to share links to pages in TroopTrack with multi-troop users. Not all of you have valid subdomains set up. We are going to contact each troop with subdomains that aren't quite right in the next few weeks and help get them fixed before we release this change. In the meantime, you can do us a favor by going to Manage -> Settings -> Edit Unit Settings and then clicking on the TroopTrack Settings tab. If you don't have a subdomain at all, please add one. If you do have one and it's not valid you will get an error message when you try to save. If you go to that page and you are able to save, then you are prepared for the change and you won't need to do anything else. IMPORTANT NOTE: Trail Life Troops don't need to sweat about this. Your subdomains are all valid already. We are doing some server maintenance this morning. You may experience problems from 9:10 am CT to about 9:30 am CT. Sorry! 1) You can now download ranks from 2016 to the previous requirements. Please note that you can download a rank that has some progress recorded, but the progress will be lost when you downgrade. 2) We fixed a problem with calculating the percent complete on ranks with the 2015 version. 3) You can now turn off RSVP'ing for events where registration is handled by a third-party, such as EventBright or a council web-site. This option is available on the advanced tab of the event form. 4) We fixed the display of bulleted lists when editing rank progress. These changes should all be live by 9:45 CT.
1) Several of you have complained that editing attachments on events and announcements is confusing. We agree! We've made it a lot easier to see what's going on with attachments by showing the current file name and putting each attachment in its own grey box. See the screen shot I included below. 2) Removing attachments from events and announcements wasn't working. We fixed this. 3) We renamed "Quick Message" to just "Email". We received complaints from new users that "Quick Message" was confusing, so we made it simpler. We also re-arranged the communicate menu a little bit to make the most commonly used features easier to find. 4) Not everyone wants to see holidays on their calendar. We have added a setting to let you turn them off. The default is on. 5) Newsletters have a lot of content, and lots of people have asked for the ability to choose which content to include. 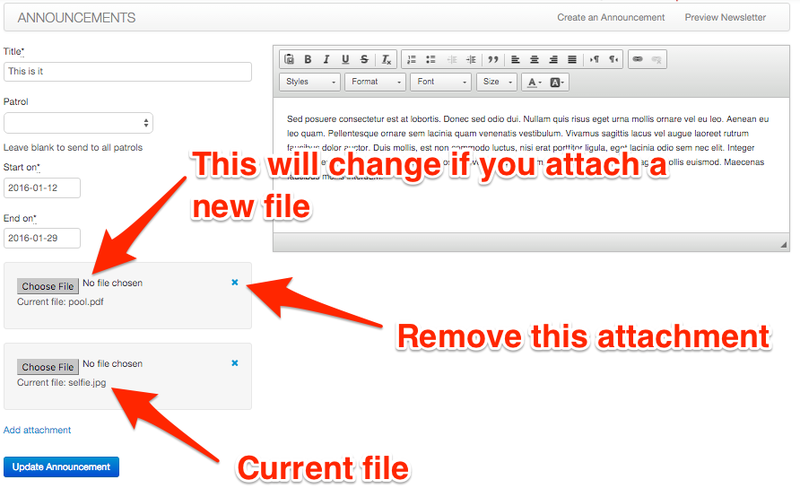 We have added the ability to customize newsletter content. Just go to Communicate -> Newsletter Settings to check it out. 6) The form for sending emails (formerly quick messages...) had a field called "mailing list ids". That's not very readable, so we changed it to say "Please choose some mailing lists". 1) If you ever added a photo or other file to a web page and clicked on "browse server", you might have noticed that the files displayed seemed random. This problem has been corrected so that only files uploaded by a member of your troop will appear there. 2) AHG troops using the "Record Individual Progress" workflow for a Patriot were not shown a full list of awards. This has been fixed. 3) We changed the label on the event and attendance form from "Camping Nights" to "Tent Camping Nights". That field was always intended to be for tent camping nights, since we don't know of any award for sleeping in a bed in a cabin! This change is meant to make that more obvious. 4) We added a submit button to the top of the edit profile form to reduce scrolling for minor changes. 5) The CSV export of the requirements report was corrected so that the column names and values are actually aligned. These changes are deploying as I write this and should be live by 7:40 AM CT.
1) Everywhere we display ranks we now also display the version of the rank (2015 vs 2016). 2) When you review ranks for an individual scout there is an "upgrade rank" button you can use to switch to the new requirements. This button will only appear if the rank is currently un-started and using the 2015 requirements. 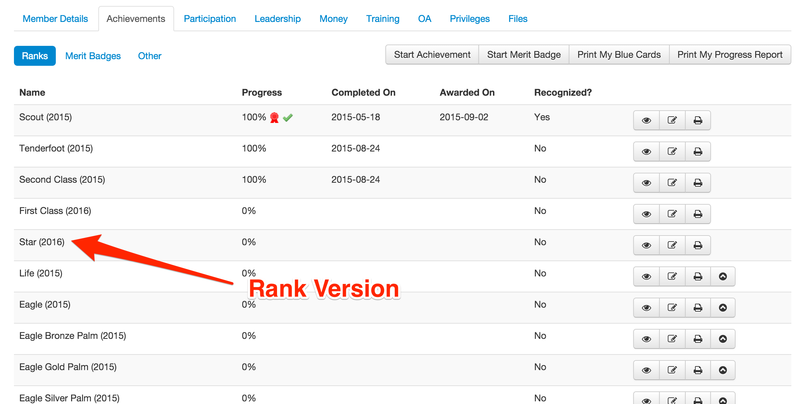 3) When you record progress for ranks in bulk you can choose between the 2015 and 2016 ranks. 4) Want to upgrade a lot of ranks at once? 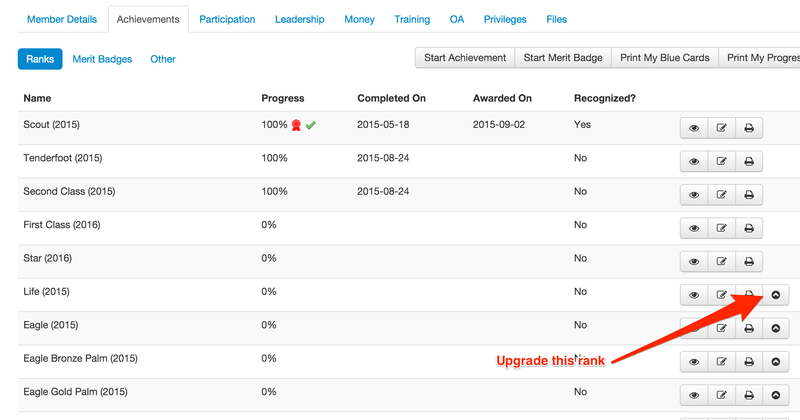 Just go to Achieve -> Upgrade Ranks for 2016 and use our easy upgrade tool to get it done. We've been having trouble with our mailing list server - Quick Messages have been working fine, but emails sent from your email client were not being delivered. We have just released a fix for this problem. Thanks to everyone who reported this problem.